London’s Savile Row and Haley Street in Santa Barbara might seem light years apart-until you meet Michael Anderson. Anderson, who co-owns (with wife Hilary) Takapuna at 428 East Haley Street, has been catering to a bespoke clientele for more than 30 years. 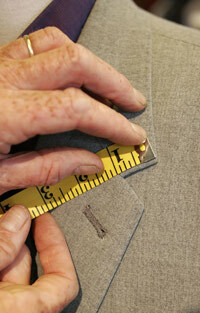 The tradition of bespoke clothing originated more than 200 years ago in an area of London now known as Savile Row. This is not news to Anderson. He picked up his tailoring skills at the source-London’s College of Fashion & Clothing Technology-where he was taught by a former Savile Row tailor. Having grown up in London, he is also an expert on dandies. The history of Savile Row bespoke clothing is also the history of the dandy. According to Anderson, a “dandy” is a man who “takes a particular interest in his clothes.” Historians agree the original dandy was 19th-century Englishman Beau Brummell, who promoted severely tailored dark colored suites (the suit itself being an English invention). This was the genesis of the smart suits worn by aristocrats and celebrities for which Savile Row is known the world over. 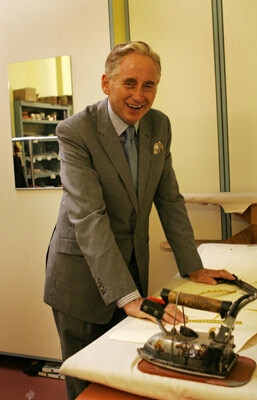 Bespoke tailor Michael Anderson in his S.B. store, Takapuna. In 1980, Anderson opened Clacton and Frinton (named after two English seaside resort towns) with Hilary in West Hollywood. “Nobody knew we were there,” said Anderson. Word soon spread, however, and the custom-made Clacton and Frinton style was adopted by movie industry hipsters like John Malkovich. Anderson offers his clients three suit variations. The “Americanized” version has a ventless jacket that fits larger men; the “James Bond” suit has a more fitted jacket with vents; and “Mao” suit (originally made for musician/producer T-Bone Burnett) has a jacket with a stand-up Mandarin collar. All suits are custom-tailored to include pockets that hold cell phones and other electronic gadgets with unsightly bulges. Anderson also makes bespoke tuxedos. Strictly speaking, the term “bespoke” refers to clothing made completely by hand using a pattern created from scratch that is cut and sewn together after several fittings until the garment fits like a glove. However, much of today’s “bespoke” tailoring skips a step and uses an existing pattern that is altered to fit the wearer. 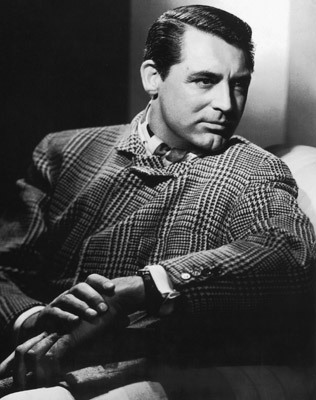 Cary Grant wearing a Prince of Wales checked jacket by Savile Row tailors Kilgour, French & Stanbury. Those quintessential modern dandies-rock stars-also happen to be Savile Row groupies: three of the four Beatles on the cover of the Abbey Road album wear Savile Row suits. Both John Lennon and Yoko Ono wore Savile Row suits when they got married. Mick Jagger wore one when he wed first wife Bianca Perez-Mora Mac-as; she wore a bespoke skirt suit (not pants as has been widely reported) created by the late French designer Yves Saint Laurent. 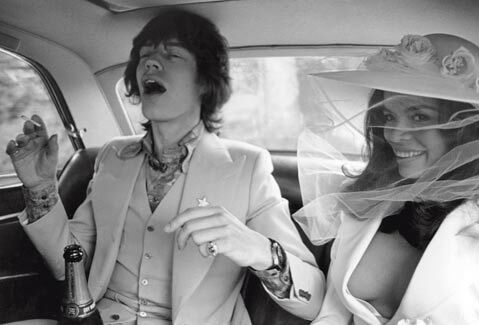 Mick and Bianca Jagger on their wedding day, Saint-Tropez, May 12, 1971. Mick's suit was tailored by Edward Sexton of Tailor Nutters, Savile Row, London. 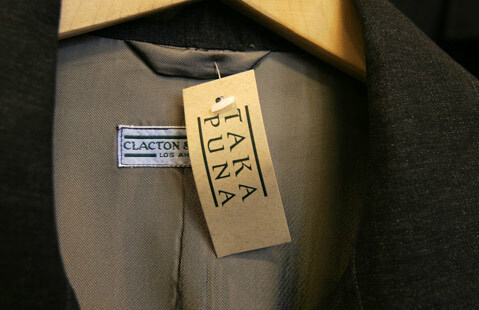 At Takapuna, most of Anderson’s bespoke clients start out buying one of his ready-made jackets. Eventually these “off the peg” clients move on to custom-tailored jackets and trousers, basking in the personalized attention Anderson provides, including hunting down the appropriate fabric to meet a client’s specifications (or whims). Some of these clients have been coming to Anderson for more than 25 years. Takapuna is hardly a male-only enclave; it also carries unique women’s clothing and accessories selected by Hilary. These items are snatched up by UCSB students, area teenagers, and hip moms. But the bespoke service is currently limited to men. Maybe some lobbying on the part of female dandies can alter this state of affairs. Takapuna is located at 428 East Haley Street. Call 963-4848 or visit takapuna.com. The London Cut: Savile Row Bespoke Tailoring by James Sherwood is available online at amazon.com.